The Versum (VSM) spin from APD has not gone well. The stock has underperformed, as enough APD investors divest a stock they likely cannot hold because of fund rules. We would like to have seen a stock split here – giving investors an opportunity to choose what to own and this might have resulted in greater stability. However, the stock now looks very attractive – the business is stable – has strong margins and cash flows and has not been saddled with excessive debt in the way that Chemours was. While much smaller, AdvanSix (ASIX) has suffered the same fate as Versum – selling off quickly as holders of Honeywell decide they do not want the small cap name. Fundamentals here are not as good – businesses are mature and we are in a subdued period for industrial growth while we deal with inexpensive competition from China. ASIX is trading at a very low EBITDA multiple after the sell off and registers on our radar as a result – we do not know the company as well as we know Versum and initial company presentations look optimistic – never a good sign in the Materials sector. Versum is a stable business, supplying specialty and bulk gases to the electronics industry, something that Air Products has excelled at for years. Its CEO has managed the APD business that has shown the most impressive improvement over the last few years, including the piece that is now Versum. There is opportunity to grow this business with some bite sized adjacent businesses that serve the same customer base. There is also opportunity for more radical moves to combine with one or more larger complimentary electronic chemicals platforms. The risks are that the company gets too ambitious too quickly or that the next step change in chip technology requires a radically different specialty gas molecule and Versum does not get the technology right. 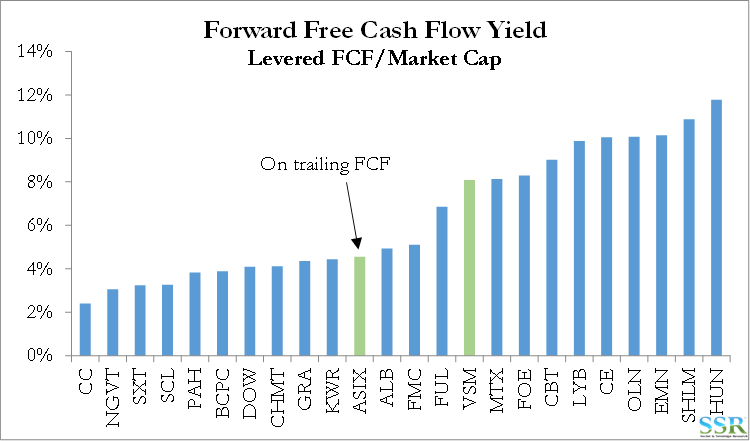 Versum is likely to attract the right group of mid-cap investors and its free cash flow yield alone should drive upside from current levels. We would expect the stock to recover at least to its spin out price. 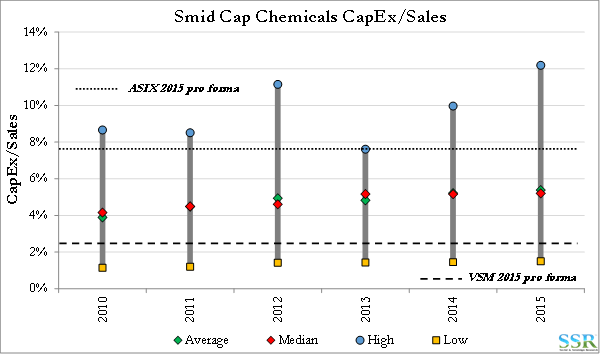 Over the last two of weeks we have seen a couple of chemical spin-offs significantly underperform on heavy volume – Versum and AdvanSix – the first from Air Products and the second from Honeywell. 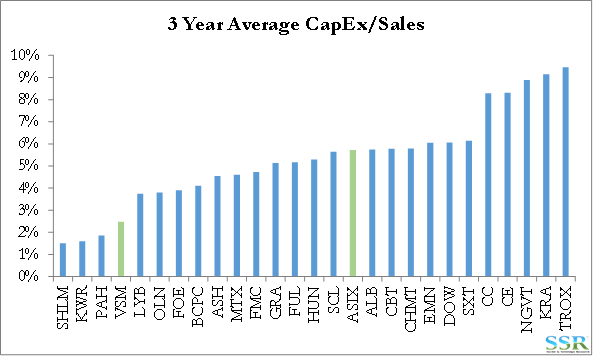 Both Air Products and Honeywell are heavily institutionally owned and the institutions that own them, in many cases, cannot find a home for a small cap or micro-cap stock – hence the heavy selling. When DuPont spun out Chemours we were critical that the company had not chosen to find a way to split – giving investors a choice rather than simply spin the company. Chemours underperformed on heavy selling also, but continued to fall long after that trade was over because the business turned out not to be what was promised. In the case of both Versum and, for those that care, AdvanSix, we think things are quite a bit different and this selling pressure offers an opportunity – albeit in an economic and energy environment which does not push Chemicals to the forefront of investors’ attention. Versum is not what was planned. Air Products had planned to separate a much larger electronic chemicals and materials business, but earlier this year elected to sell the materials business to Evonik instead. Versum is for the most part a specialty gases business, targeting the electronics market, but also handles the bulk gases (especially nitrogen) that Air Products had sold into the chip making and other electronics businesses. Sales last year were $1 billion for the 12 months ending December 2015 (VSM follows APD’s September fiscal year end) and for the first six months of this year fell by 7% versus the same period last year. The company has inherited around $1 billion of Air Products debt but has strong cash flows and very responsible management. It is also in a deal rich or likely deal rich segment, in our view, especially once the Dow/DuPont transaction happens as we might see the combined Dow/DuPont electronics platform look to grow through acquisition and Versum would be a natural target and very complementary fit. The risk is that Versum goes on its own acquisition spree in an inflated M&A market today. AdvanSix is the old Honeywell specialty nylon 6 business at its core, but also has the (largely by-product based) ammonium sulfate and a chemical intermediates business. 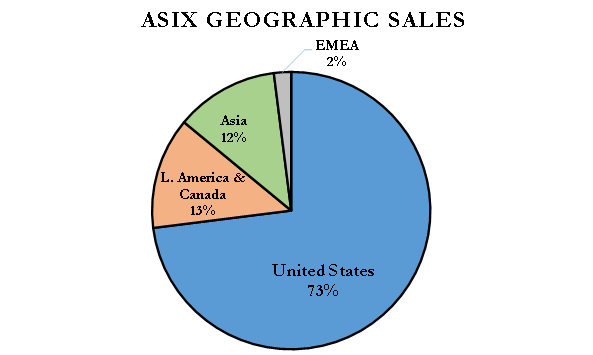 Revenues are around $1.3 billion and 75% in the US, with very limited exposure to Europe, which makes the story more attractive (Versum also has limited Europe exposure). 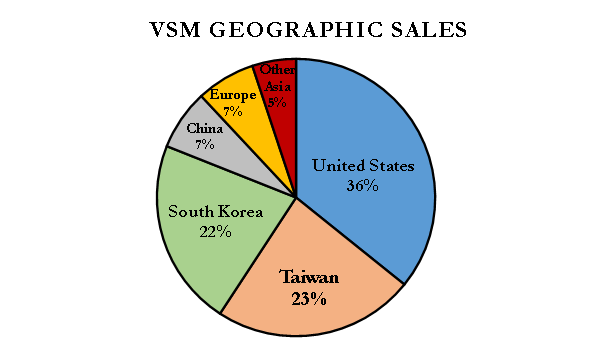 As a large buyer of cumene, ASIX does not get much of an advantage from the cheap US natural gas position and this is another area where cheap China coal is an issue, but nylon 6 has not seen strong global growth for years, and while it has seen some investment it has not seen the investment attention in China that products like urea, methanol, propylene and PVC have. The attractiveness of this stock is how cheap it is after its initial underperformance, with a strong cash flow yield and very low multiple of earnings – below 6x. The risk here is that management is too optimistic – certainly the tone of its management presentation is very bullish for a collection of mature businesses and capex estimates look too high. We would certainly be interested in Versum at current prices – this is a strong and fairly stable business and it is run by the Air Products Executive, Guillermo Novo, who drove most of the earnings growth at the company in the year preceding the change of leadership and the year following, before the cost cutting activities cut in. It is not saddled with debt, but at the same time it does not have enough debt capacity to go out and make a big cash deal, which is good. There may be some small bolt-ons that make sense. In Exhibits 2 through 5 we show the business mixes for VSM and ASIX. 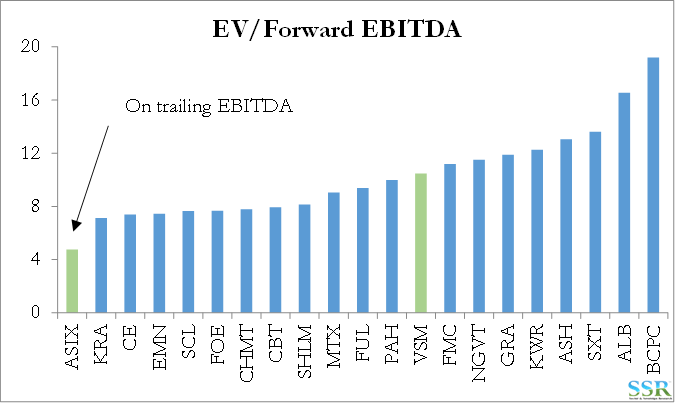 We like the specialty, stable margin nature of the VSM business and believe that its current valuations undervalue the portfolio. 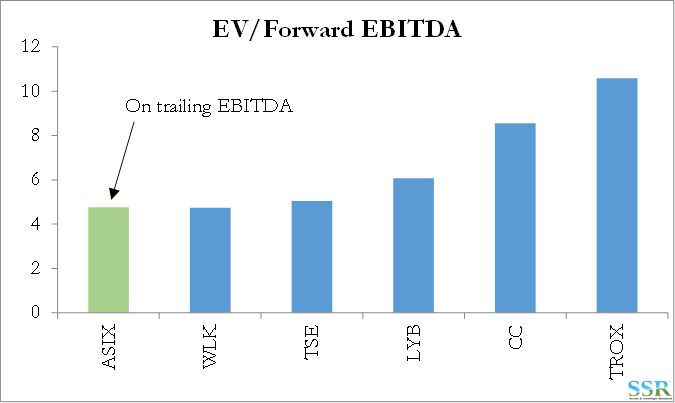 While the business at ASIX is far less stable and it likely will to struggle to grow, its multiples are also at a significant discount to possible peers such as CC, TROX, WLK, TSE and LYB – suggesting upside. From a geographic perspective, both companies are very underweight Europe – Exhibits 4 and 5. This would be expected for VSM given the dominance of Asia from a chip manufacturing perspective, but is a bit of a surprise for ASIX and is another reason to look at the stock today given concerns about demand in Europe. 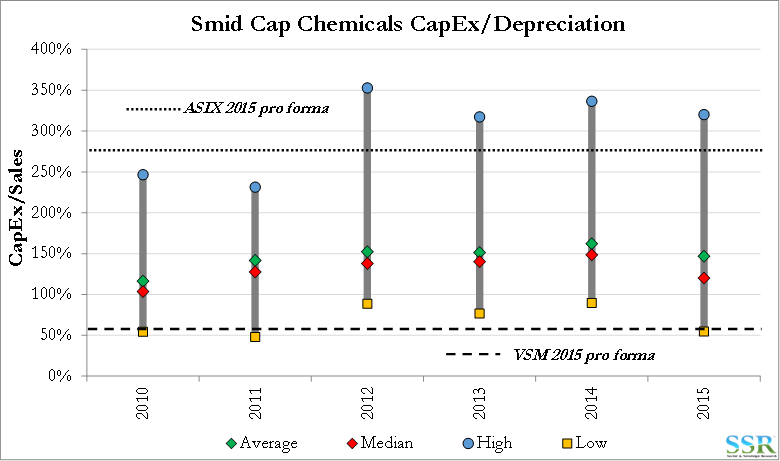 We think that VSM has a good cash flow story to tell in part because of relatively low capex, while the same subject is a bit more challenging for ASIX because of what looks like quite high capex – Exhibits 6 through 8. 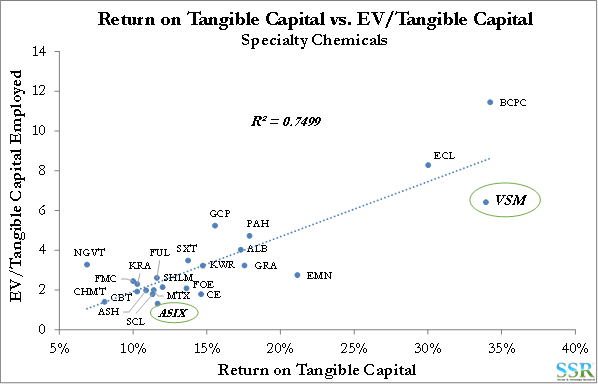 ASIX looks really cheap compared to the rest of the smaller cap specialty chemical universe – Exhibit 10 – in part because of the recent sell off but possibly because of the risk that the investment community thinks of it as a commodity company. If we compare with the commodity universe the stock still looks cheap – Exhibit 11. VSM also looks very interesting on this basis – to trade at a 12 multiple VSM would have 25% upside. If ASIX could trade at the commodity average it would have more than 50% upside. APD spun out Versum with roughly $1 billion in debt – about 3x trailing EBITDA and on the higher end of the spectrum but free cash flow offers sufficient coverage. 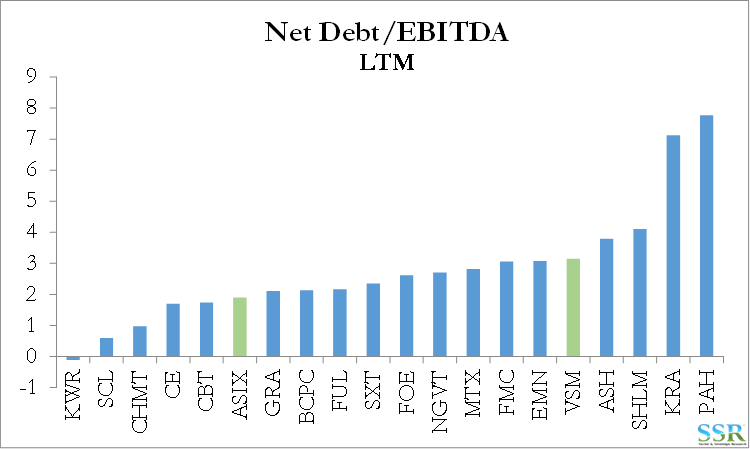 ASIX listed last twelve months debt/EBITDA at 1.9 as of June 30 which compares favorably with the group – Exhibit 12. 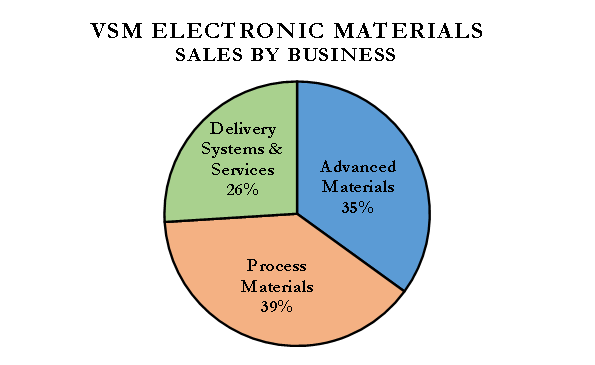 VSM Materials (~75% of sales) has the superior margin profile compared to the Delivery Systems and Services (~25% of sales). 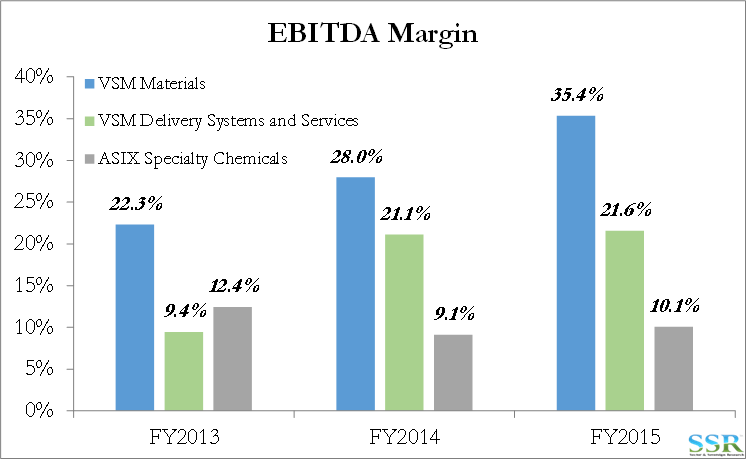 ASIX Specialty Chemicals’ margins are lower but appear relatively more stable (though slightly declining) over the past three years – Exhibit 13.